This radiant 4-piece medium rainbow zinc grinder is truly mystic and pleasing to the eye. 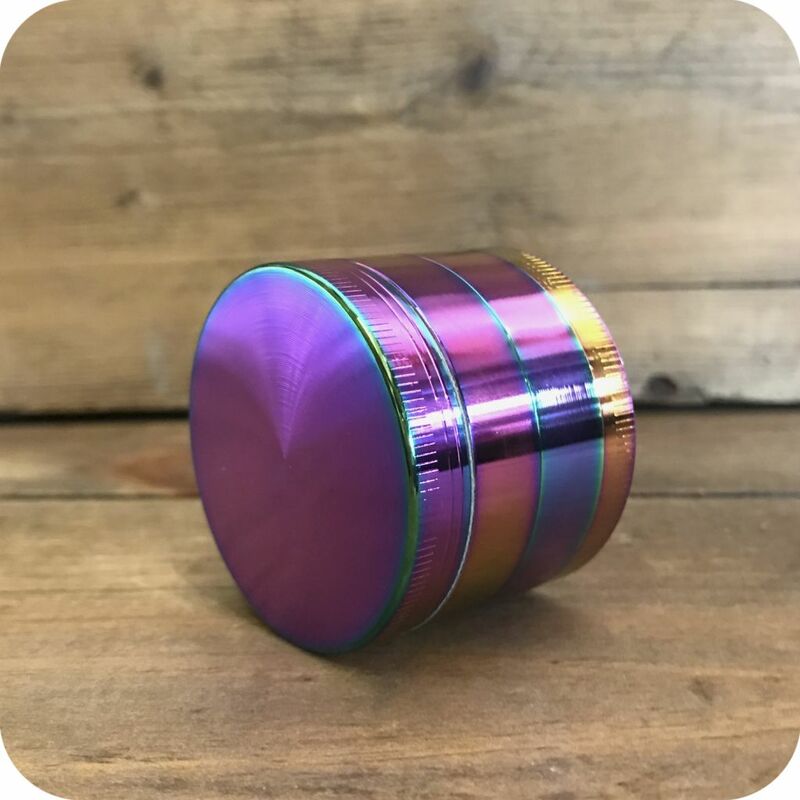 From its aesthetics to its performance, this grinder will captivate you with each twist and turn. But don’t let its pretty face fool you. This grinder is here to get the job done. 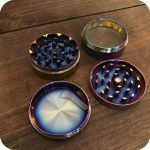 Equipped with three chambers and a fantastic set of teeth, this stunning grinder is sure to impress. 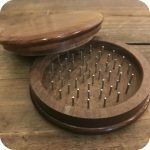 This grinder’s rows of sharp teeth will grind your legal herb to a perfect finish. The more finely ground the herb, the better the smoke session. Your ground material will collect in the second chamber where a fine mesh screen sifts out precious particles known as pollen. Pollen is perfect for smoking by itself or sprinkling on top of a bowl or hand-rolled cigarette. Conserving and collecting pollen is a beautiful thing to the conscious smoker. You don’t have to worry about missing out on this valuable commodity due to this third chamber. With this grinder, no part of your herb goes to waste. 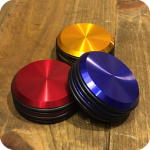 Simply give your grinder a good tap after you’ve ground your material and your pollen collection has begun. The grinder itself is made out of Zinc, which is known as a better and safer alternative to aluminum. It also changes color with different angles while always maintaining its radiance. Additionally, it can be utilized as a storage space for saving material for later or for taking on the go. This precious grinder is measured at 2″ in diameter and 1.90″ in height. A good grinder is an essential which makes this medium zinc rainbow grinder the perfect gift for the person you love or for yourself. 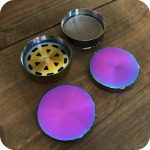 Advance your smoking ritual with our Rainbow Zinc grinder today. Tags: Brooklyn, brooklyn glass, brooklyn smoke shop, bushwick, bushwick head shop, bushwick smoke shop, glass, glass pipe, glass shop, heady glass, Metal Grinder, new york, new york city, new york city headshop, new york city smoke shop, pipe, pipes, Pollinator, rainbow zinc, rainbow zinc grinder, sunflower, Sunflower Glass Co, Sunflower Glass Company, sunflower pipes, williamsburg, williamsburg head shop, williamsburg smoke shop, zinc grinder.